On 22 October 2015, I was invited to Malaysia's premier jeweler Selberan's Ideal Diamond 10th Anniversary celebration and the unveiling of their Leia Collection which was designed specially for the 10th Anniversary. The event was held at Selberan's Pavilion Kuala Lumpur Boutique. It was kept simple with free flow of drinks and canapes whilst DJ Ira put us all in to party mode. While awaiting the highlight of the event, a fashion and jewelry show, guests were encouraged to try on anything they liked that was on display. Whilst mingling I managed to say hi to the designer for the outfits that would complement the jewelry, Eggie Azman. According to Selberan, the reason they chose to collaborate with Eggie Azman was her knack for modern designs with an avant garde twist. Eggie Azman's brand DNA goes hand in hand with Selebran's brand where traditional design masterfully meet contemporary style. The following pictures are Themodelmom's picks from the jewelry show. Honestly, one must go to their boutique and check out the entire collection as there will be something to suit each taste. This daring and unrivaled Leia series is inspired by sculptural forms expressed in a variety of rings, pendants & earrings which show off sparkling, ideal cut diamonds in designs that are audacious and sophisticated. The Leia solitaire ring is a dazzling masterpiece, set with a scintillating Selberan Diamond atop of a sculptural design. The Leia diamond rings are created with a love of bold and striking forms in mind, resulting in a jewel that leaves an impression on those who set their eyes upon it. The Leia solitaire rings come in two versions – one is a more refined and delicate interpretation, while the other version is an assertive expression of the design. Both have detailing on the shoulders which refer to one another in this family of jewels. 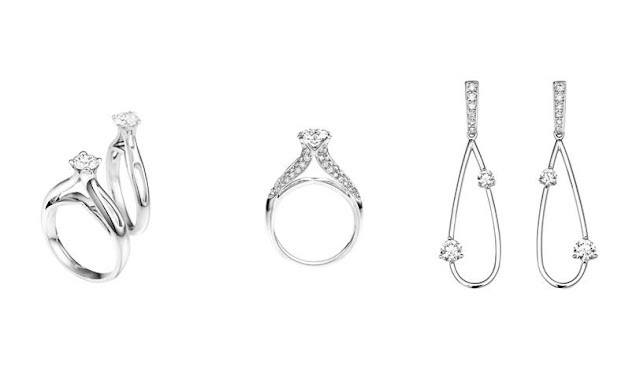 The elongated almond shape - striking in its length and accented by solitaire diamonds, make for elegant earrings. With their exaggerated size, these jewels are a call for attention. Likewise, the Leia pendants are pieces that have a delightful balance of glamour and fun. The diamonds in the pendant or earrings can be customised to sizes of one’s choice – either with petite & beautiful Selberan Diamonds to catch the light and sparkle, or dazzling carats that go as large as you dare. The sensational and unabashed Leia series in 18k white gold is now available in all Selberan boutiques in Pavilion Kuala Lumpur, Suria KLCC, The Gardens Mid Valley City as well as the Royal Selangor Visitor Centre in Setapak where the administration offices are based.